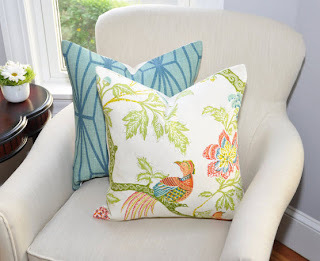 Linda from My Crafty Home Life was lucky #7 and the winner of the Lily on Blue pillow giveaway!! 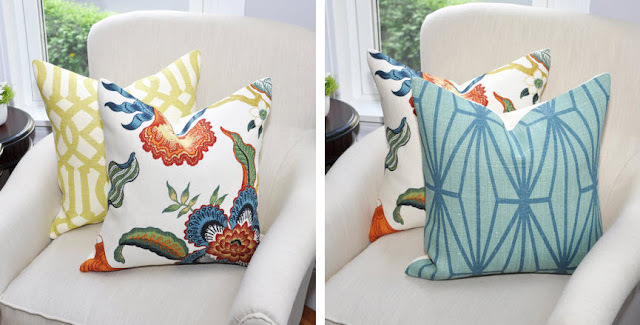 I can't wait to see her new Schumacher Arbre Chinois pillow grace the cushions of her sofa (or maybe a chair or bed). I got my own Lily on Blue pillows the other day and I am obsessed! I already had the navy zigzag pillows, and with the addition of a little Chiang Mai and Windsor Smith Pelagos my sofa is now complete. Even if you wernt the lucky winner, you still have a chance to get your very own Lily on Blue pillows. The 20% off sale has been extended till Sunday and with the code LEB20OFF you can get any of the lovely pillows in stock!! Don't forget, it's only till Sunday. So head on over to Lily on Blue and punch in the code LEB20OFF to get some new sofa bling!! Love these pillows....might just have to buy myself a mother's day gift. Lucky Linda for winning! Wow, thank you so much...I will e-mail you! The pillows are beautiful and can't wait to see what Linda does with them! I am heading there! love the chevron. ahhh love that hothouse flowers pillow!